This eight-week introductory course focuses on observational drawing skills and is suited to beginners and artists who have not had traditional drawing training. Students will learn a range of drawing methods to depict tone and shape in a confident and accurate way. Using a range of materials including pencil, charcoal, pastel and ink, students will create competent drawings of a range of subjects. 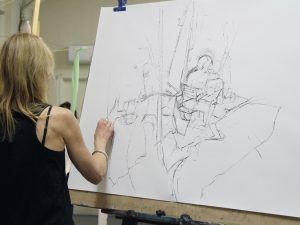 Each session focuses on one drawing method, beginning with looking at artwork examples and a drawing demonstration, followed by guidance throughout the drawing process. Taught by Archie Barry, a Melbourne based artist with a Masters of Contemporary Art from the Victorian College of the Arts, who we’re excited to welcome back after recently returning from an artists residency in Berlin. Please note that all required materials are included in the course fee and will be provided by the studio.